At some point when you were a wee child, your parents or teachers probably gave you a simple—but incomplete—explanation of why leaves change color in the fall: green chlorophyll fades to reveal the yellows and oranges that have been there all along. That's true, but that's not the whole chemical story. Over at Compound Interest, Andy Brunning has made yet another infographic that gets into the geeky and fascinating details. Yes, the green of chlorophyll gives way to the yellow, orange, and red of carotenoids and flavonoids. But that deep purple and magenta you sometimes see? 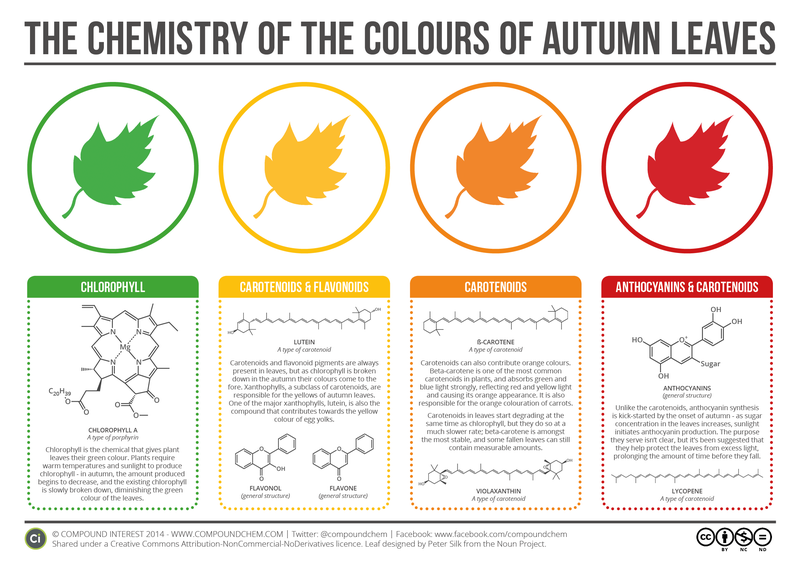 That's an entirely different class of compounds, called anthocyanins that plants only start making in the fall.